Illustrates the blockade of the Japanse home islands - references the Twenty-First Bomber Command. This is an enlarged, separate issue version of a 1945 R. M. Chapin, Jr. map of East Asia created for TIME Magazine. The map depicts the region from the Chinese coast to the Pacific Ocean and from Manchuria to Okinawa and Taiwan. 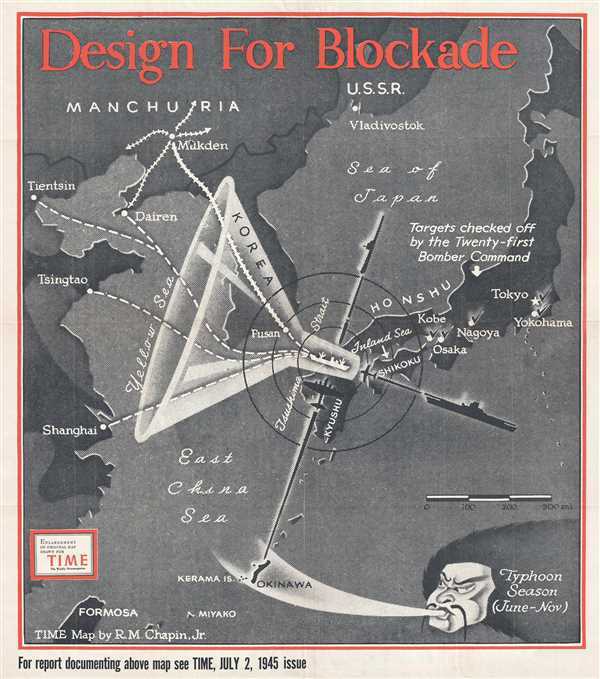 Created to illustrate the naval blockade of the Japanese home islands, Chapin demonstrates how shipping from Japanese-occupied China and Korea is 'funneled' into the Kanmon Straits between Honshu and Kyushu. By taking advantage of this tactically vulnerable space from both sea and air, the American and Allied forces effectively cut Japanese supply lines. Using carrier-based aircraft, bombers from Okinawa, and naval vessels, the American blockade proved nearly impenetrable. The inland water routes and ports of Japan were also mined by the Army Air Forces to increase the damage done to Japanese shipping. Apart from the blockade, Manchuria, China, Korea, and the U.S.S.R. are labeled, along with numerous cities, such as Vladivostok, Mukden, Tientsin, and Shanghai. Several cities in Japan, including Tokyo, Yokohama, Nagoya, Osaka, and Kobe, are labeled and 'checked off', per the map, by the Twenty-First Bomber Command. The Twenty-First Bomber Command was based in the Mariana Islands, an archipelago in the western North Pacific Ocean. The command flew B-29 Superfortresses, one of the largest and most technologically advanced aircraft flown during World War II. Based out of airfields on the captured islands of Saipan, Tinian, and Guam, B-29s carried out raids against Japanese home islands. Although infamous for dropping the atomic bombs on Hiroshima and Nagasaki, B-29 raids using incendiary bombs on Tokyo, Osaka, and the other 'check off' cities killed hundreds of thousands. By July 1945, when this map was created, numerous incendiary missions had been executed against Japanese cities, incinerating numerous square miles during each raid. This map is an enlargement of a map that was created by R. M. Chapin Jr., a TIME Magazine cartographer, for the July 2, 1945 issue of TIME Magazine. Very good. Wear along original fold lines. Verso repair of fold separation. Blank on verso.